If you are interested in learning jQuery Mobile, you made the right choice. It is one of the top frameworks for development of mobile sites and applications. The framework has a comprehensive and well written documentation. This tutorial complements framework resources. Many people learn well by example and in this tutorial you will build a simple but fully functional mobile application. The application allows you to maintain a list of your favorite website and share sites from the list with other mobile users through QR codes. While building the application you will cover framework features such as creation of pages, forms, lists, dialog boxes, style themes. You will also create dynamic pages and manage data using local storage. The tutorial source code is available at https://github.com/rtekie/shareqr. To keep things simple you can test the code locally using a desktop Chrome or Safari browser. Testing using a mobile emulator is another option. You can also access working application at http://rtekie.herokuapp.com/shareqr.html and try it on your mobile phone. Part I of the tutorial covers framework basics – creation of static pages. Part II introduces dynamic pages. In Part III you will add data management features – ability to add, store and delete records – and complete the application. jQuery Mobile relies on HTML5. Hence the HTML5 doctype declaration. jQuery Mobile requires jQuery and you need to include not only mobile framework files (jquery.mobile-1.2.0.min.js and jquery.mobile-1.2.0.min.css) but also the regular jQuery framework (jquery-1.7.2.min.js). Viewport meta tag is used to initialize page dimensions and zoom level. jQuery Mobile uses extensively HTML5 data- attributes to control page elements’ look and behavior. The first attribute introduced by this tutorial is data-role which is used to identify pages and page structure elements – header, content area and footer. As you can see, with just a few lines of code you can create a robust, skeleton page. Web pages designed for desktop are typically displayed by loading their own, separate html files. In the mobile world, pages are typically small and connectivity slower and sometimes problematic. Hence there are advantages of packaging multiple pages into a single html file. A file is loaded once and all pages contained within the file can be displayed without any additional network requests. Page packaging is one of the features of jQuery Mobile. Next we will add page navigation. Links to pages rely on page id, which has to be unique for each page. Home page has id=”home” hence a link to the home page will use href=”#home”. Similarly the About page has id=”about” and a link to it will use href=”#about”. The link is automatically rendered as a button. It can be further improved by adding an icon. jQuery Mobile includes a number of icons you can choose from. We will use the info icon. You can find out more about jQuery Mobile footer features at the Footer configuration page. This time we would like to see an icon only button, and to accomplish that we will add a data-iconpos attribute. Here we are using data-rel="back" attribute to indicate that the button should mimic behavior of a browser Back button. 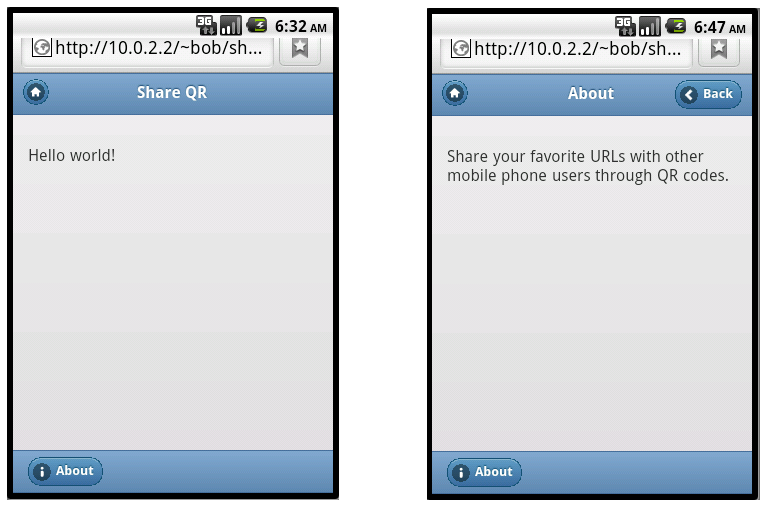 You can find out more about jQuery Mobile header features at the Header bars page. So far we covered basic framework features and built two simple, static pages. In Part II we will add dynamic content and in Part III data management capabilities.